TORONTO, ONTARIO, October 26, 2017 – Get behind the wheel of the 2018 Lexus IS and accelerate your life. New for 2018, the IS 300 in rear wheel drive configurations joins the IS 300 AWD and IS 350 AWD. The 2018 IS presents its athletic prowess from every vantage point. The bold signature Lexus spindle grille is flanked by air intakes that clearly announce this luxury sport sedan’s performance-focused intent. Auto-levelling LED headlamps and LED daytime running lights fuse effortlessly into a character line that runs the length of the silhouette, imparting the impression of a vehicle in motion – even when standing still. Heated exterior mirrors include integrated signal lamps. Available F SPORT packages add a distinct mesh grille, larger cooling ducts to help reduce brake fade, an exclusive alloy wheels. Inside, the five-person IS cabin is thoughtfully designed to engage the driver’s senses while enhancing command and control. The gauge cluster reinforces the sense of sitting in a cockpit, while generous interior dimensions and uniquely shaped seat backs offer rear seat passengers plenty of room to relax, complete with amenities like fold-down centre armrest and multiple cup holders. The 60/40 split folding rear seats also enhance cargo-carrying capacity and versatility. Other notable features include dual zone automatic climate control, power-adjustable front sport seats, a multi-information display, tachometer, dual trip odometer and outside temperature gauge, auto-dimming rear view mirror with HomeLink, power windows with auto up/down on all windows, water repellant front door window glass, a leather wrapped steering wheel, metallic shift knob and dash accents, stainless steel scuff plates, steering wheel mounted audio controls, map lamps, the smart key system with push button start, an integrated garage door opener, 12-volt accessory power outlet, keyless entry with trunk release, the signature Lexus analogue clock with LED illumination, and more. The IS 300 RWD is built around a 2.0L twin-scroll turbocharged four-cylinder that delivers up to 241 horsepower and 258 lb-ft of torque. This is mated to an eight-speed automatic with sport direct shift control and sequential multi-mode shifter. The IS 300 AWD features a 3.5L V6 direct injection four-stroke gasoline engine rated at up to 260 horsepower and 236 lb-ft of torque. This is paired with a six-speed automatic super electronically controlled transmission with sequential multi-mode shifter and an advanced all-wheel-drive system that automatically allocates engine power between the front and rear axles to help maintain superior traction without ever sacrificing drivability. The IS 350 AWD features the same powertrain configuration as the IS 300 AWD, but specially tuned to deliver a peak 311 horsepower and up to 277 lb-ft of torque. All models are fitted with steering wheel-mounted paddle shifters for finger-tip gear selection. The drivetrain is further enhanced with the Lexus Vehicle Dynamics Integrated Management (VDIM) system, vehicle stability control and traction control. Drivetrains also feature a three-setting drive mode select system, letting the driver choose between Normal, Eco and Sport settings as the mood dictates. Performance suspensions – proven on some of the world’s most iconic race tracks – feature a double-wishbone configuration up front and multi-link control arms at the rear, enhanced with stabilizer bar. Electric power steering is highly responsive and efficient, while large ventilated disc brakes on all four corners ensure there’s plenty of stopping power. The IS series also features impressive safety performance. New for 2018, all models are now equipped with a back-up camera as standard. All models also feature Lexus Safety System +, including the pre-collision system with pedestrian detection, automatic high beam, dynamic radar cruise control, and lane departure alert with lane keep assist. Other safety features include 10 airbags, ABS with brake assist and electronic brakeforce distribution, a direct tire pressure monitoring system with auto location, anti-theft system, an onboard first aid kit, and more. The 2018 Lexus IS 300 RWD F SPORT Series 1 (Starting MSRP: $44,650) adds several unique F SPORT features, including 18” alloy wheels, 3-spoke steering wheel, seats, mesh front grille, an aerodynamics package, shift knob and scuff plates. Other enhancements include Active Sound Control, the Blind Spot Monitor and Rear Cross Traffic Alert safety systems, heated and ventilated front seats, an instrument cluster inspired by the Lexus LFA supercar, a power moon roof, electrochromatic side view mirrors, and more. The 2018 Lexus IS 300 AWD with Premium Package (Starting MSRP: $45,300) adds a heated steering wheel, 18” alloy wheels, heated and ventilated front seats, and a power moon roof. The 2018 Lexus IS 300 AWD with Luxury Package (Starting MSRP: $48,250) builds on the Premium Package, adding a power tilting/telescoping steering column, driver’s seat memory linked to steering column and exterior memory mirrors, a navigation system with 10.3” display screen and Remote Touch interface, the Blind Spot Monitor and Rear Cross Traffic Alert safety systems, the Lexus Adaptive Front Lighting System, clearance and backup sensors, a power rear window sunshade, and more. The 2018 Lexus IS 300 AWD F SPORT Series 1 (Starting MSRP: $47,200) adds several unique F SPORT features, including 18” alloy wheels, 3-spoke steering wheel, seats, mesh front grille, an aerodynamics package, shift knob and scuff plates. Other enhancements include heated and ventilated front seats, an instrument cluster inspired by the Lexus LFA supercar, a power moon roof, and more. The 2018 Lexus IS 300 AWD F SPORT Series 2 (Starting MSRP: $50,000) builds on the Series 1 configuration, adding a power tilting/telescoping steering column, driver’s seat memory linked to steering column and exterior memory mirrors, a navigation system with 10.3” display screen and Remote Touch interface, a heated steering wheel, clearance and backup sensors, and more. 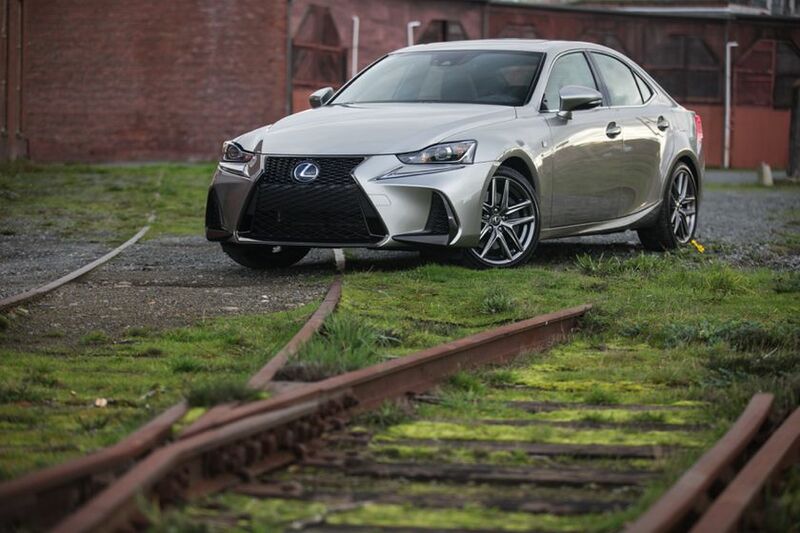 The 2018 Lexus IS 350 AWD F SPORT Series 2 (Starting MSRP: $54,200) adds several unique F SPORT features, including 18” alloy wheels, 3-spoke steering wheel, seats, mesh front grille, an aerodynamics package, shift knob and scuff plates. Other enhancements include the Adaptive Variable Suspension System, an instrument cluster inspired by the Lexus LFA supercar, and more. This model also features a 10-speaker Lexus Premium Audio System. The 2018 Lexus IS 350 AWD F SPORT Series 3 (Starting MSRP: $55,800 builds on the Series 2 configuration, adding the 15-speaker Mark Levinson Surround Sound Audio system, the Lexus Adaptive Front Lighting System, a power rear window sunshade, and more. The 2018 Lexus IS series is now on sale at Lexus Dealers across Canada. For complete and up to date details and specifications, visit www.lexus.ca/is.